The Urban Unschooler: IS THE WORLD FILLED WITH SPOILED KIDS? 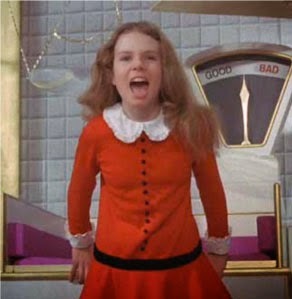 I often think of Veruca Salt in Charlie and the Chocolate Factory as the epitome of a spoiled child. In this example, her father was a pushover. He was so afraid of Veruca throwing a fit or embarrassing him that he gave into her immediately. To me, this is a child who is spoiled. And it’s not the fault of the child whatsoever, it is the fault of the parent. To that end, I don’t think the stories I hear described as "spoiled kid" stories like the unwillingness to help out around the house or demanding something when we are out are truly about spoiling like I see with the example of Veruca Salt. They are common stories that all parents have experienced or will experience some time in their parenting career. But, they certainly can give us pause and cause us to believe that we’ve created ungrateful kids who don’t understand social norms. But, as with the idea of Veruca Salt, there may be a level of culpability here that needs to be explored. So to get back to the idea of spoiling a child, this is a cultural concept of scarcity and denial and its tied to the belief that “everything in moderation” or “good things come to those who wait” “spare the rod, spoil the child” — these are religious concepts and came into play to help mollify the masses - and justify a ruling class. But they have no place in developmental psychology. It’s been proven by science and brain research that babies should be responded to when they are in need. And those children who do get their needs met have much stronger attachment and therefore are set up to have stronger self–esteem and independence and strong emotional relationships as they grow. And I would question whether people would truly believe that “everything in moderation" is a true in all cases — do you want to have love in moderation? Or have happiness in moderation? Or health in moderation. The argument just doesn’t hold up. A key element I see missing in many kids these days is empathy. When kids are treated empathetically by their parents and extended family, they will gain the skills to be empathetic. Unfortunately, conventional parenting styles are not empathetic, so children are not modeled empathy and therefore do not know how to be empathetic. This all goes back to attachment theory and the benefit of responding to infant needs early on in the first 2 yrs of life. But modeling empathy continues to be critical long after the first 2 yrs. As Peter Gray discusses in the article above, narcissistic behavior is highlighted by a lack of empathy. It is when we can put ourselves into another’s shoes that we begin to be able to understand their motivation and needs. When others have treated us well, we can much more easily treat others well as a result. Brain (Neuro) research is relatively new (really coming into play in the last 20 yrs) – so many of the ideas we have around raising kids come from anecdotal evidence and hearsay, much from religious roots where control and pacification were the main goal. Here in the US, our childrearing instincts are horrifically off base and we’ve lost touch with how children were raised and educated over the centuries. The behaviorist theory (behaviorism) promotes the idea that all learning is caused by external stimuli and all behavior can be shaped through positive or negative reinforcement. It is at the root of many childrearing strategies that have become mainstream in our society. Time-outs, sticker charts, grades, groundings, threats, 123 magic, and on and on are foisted on parents around the US as the status quo for raising a “good” child. But beyond the fact that behavior modification is not a great way to raise kids, a key lack of behaviorism techniques is that they actually do not model empathy at all. They never try to figure out why a child is misbehaving, they never validate the emotions being felt and they often miss the core issue at hand – because ending the “behavior” trumps helping the child to manage through the emotional turmoil they feel. A child whose emotional life is disregarded will have no willingness to care about others in his/her life, no one has cared about his/hers. One of the largest organizations that uses a behaviorist model is the institution of school. School focuses on achievement, doing things for rewards, punishing/shaming for those things we don’t want to promote and pretty much foregoing play for sitting at a desk doing repetitive tasks that have marginal value to a child (although huge value to the adults around them). In essence kids are often asked to forego their own motivations, passions and interests to please the will of adults and to get judged, assessed and ranked for their achievement. This is the world in which most children in the U.S. grow up. So when I think about spoiling a child, I think more of the unintended consequences of Behaviorism that children are exposed to from earlier and earlier ages and the level of control these systems impart over our kids and the implications of that reward and punishment system on their broader lives and their ability to understand empathy and to act empathetically. I think simply looking at the easy, “we parents have such bratty kids” mentality is missing the larger issue that our societal choices are a key factor in creating the outcome that we are seeing with our kids. Kids are disrespected every day of their lives, they are yelled at, they are misunderstood and they are trying to survive and find a way to protect their fragile egos every day. They end up finding only these rudimentary methods that look, to the casual observer, like “being spoiled” but I see these as the only method left to them to assert their authentic selves into the mix and to be heard. Kids are left only with “refusal” and “digging in” because they are the only tools in their bag that are left. A sorry state of affairs, when kids are amazingly capable of compromise and negotiation. But to change this state of affairs, it takes flipping conventional notions of kids and their willingness to come along. I know many kids, most homeschooled, who are treated with respect, who are valued for their age-appropriate contribution to their families and who are not raised in a behaviorist model and they are amazingly empathetic, helpful, happy kids who have the capacity to give to others because they have all their needs met. 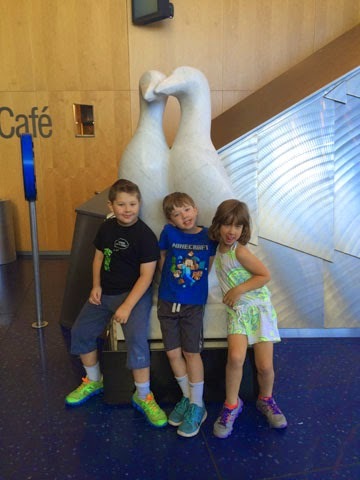 Sawyer Fredericks, a current participant on The Voice – is just one of these types of kids. It’s wonderful that when we actually do SPOIL and I define spoil as "give to our kids unconditionally” we end up with children who understand that the family is a supportive organism that accepts everyone’s limitations and contributions. A place where everyone has each other’s backs. I hope some of this helps frame a conversation that may be a little more vibrant than just the “kids these days” mentality that justifies more of the same disrespect that is rampant out there. Our kids deserve a life of respect and in granting it to them, we will gain a generation of adults who can actually solve hard problems and work to fix our political system. Without this change, we’ll get more of the same and lots more of parents feeling justified in treating their kids as second class citizens. I personally don’t want to see that continue to be reality.